This was a busy week! 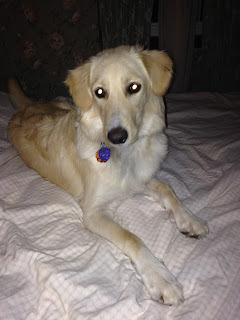 First, my week began with my cat running off when a neighbor's dog attacked my dog Max -- IN MY YARD! I know, some nerve, eh? Max recovered with a few bites to his neck which healed quickly. 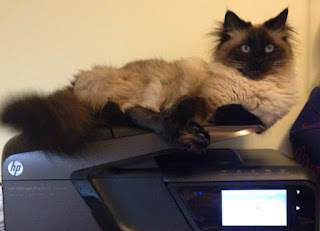 But Buster, my long-haired Siamese got freaked and ran off. He came home 2 days later, like nothing ever happened. I was so worried, thinking that dog would have turned Buster into a light snack. So now Buster is grounded for a month and not allowed outside. He is none too pleased with this turn of events. He is a pretty independent cat, and I worry that dog could be back! Along with all the critter drama, I have been shipping patterns and writing more patterns, working on my 2017 BOM and trying to overcome 2 weeks with bronchitis! I am drained! But here is the good news. Two new deco blocks are available. #48 is Rosey Posey and #49 is Cyclamen. I am so close to having 50 of these done, which was my initial goal. Now I am not sure if I should keep going or just say enough! This week I also released another free block: The crossing block for the Fair Isles BOM. You can pick up this block for free on the 2017 BOM Tab on my Blog. You can also still get the February block for free for a few more days. The Crossing Block is used between each of the monthly blocks. There are 13 of these in the setting I am showing on my BOM page. This block will be available for free for a few months so everyone who wants to do this setting will have access to this block. Remember, these blocks are all paper pieced this year. I am almost ready to post the March Fair Isles blocks also. If you are a subscriber you will get links to both of these blocks in my newsletter that comes out March 1. I couldn't decide which way I liked it better. I drew it with the white background and the dark blue corner leaves. But the reverse is kinda growing on me. Which way do you like best? The block for February has been posted and is ready for you to download for free for 30 days. You can still get block 1 for free for a few more days, if you didn't get it yet. This block is called Bridget's Wedding and is named after my niece who just got married. Be sure to subscribe to my newsletter if you want this month's free bonus block. Which one do you like better? White on blue background, or blue on white background? I also have the February Flower of the Month table runner on half price for all of February at Morning Glory Designs.com. I opened my issue of American Patchwork & Quilting that came in the mail today and guess what I found? It is the April 2017 issue, and on page 73 was a copy of my quilt pattern in the Northcott ad! This is really an amazing picture for a number of reasons. 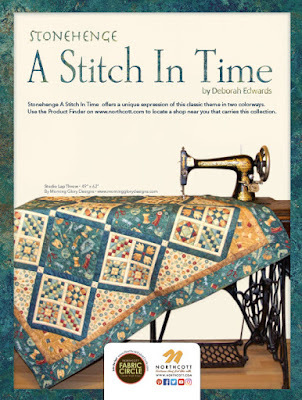 Of course I am thrilled that they chose my design to feature for their new A Stitch In Time fabric collection (which is fabulous, I might add). But the pattern includes two sizes -- a throw and a table topper -- in the pattern. But there are also two more patterns using this line in addition to this Studio Throw pattern. You can get them here on my Website. and a Studio Organizer using this fabric collection. This last design is super easy! The squares with the saying on them are pockets, sewn onto the background fabric, for storing tools and notions in your sewing room. The fabrics are all pre-print stripes, panels, and prints, so there is very little piecing in this project. 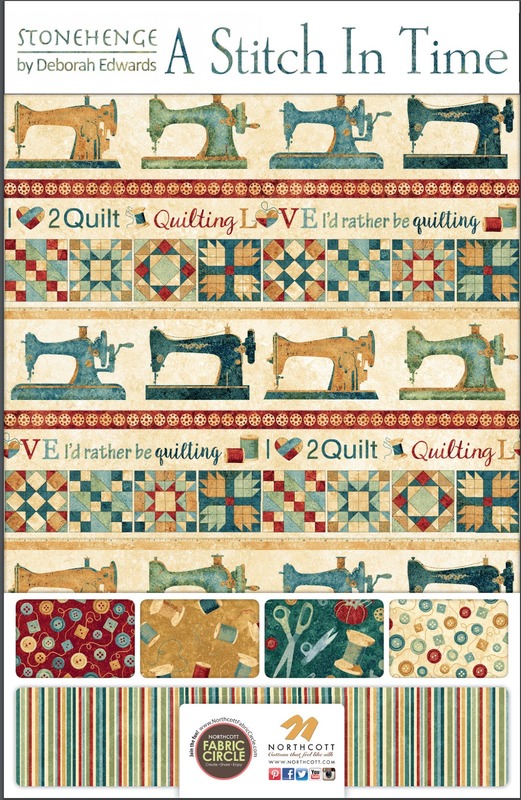 Check out the Northcott website for this fabric line. There are several great tote bag patterns (by other designers) that are very cool and would go well with these patterns.These vintage block and sewing machine prints go with a group of Stonehenge fabrics in a collection called Oxidized Copper. What is not to love about these? I love designing patterns for Northcott because they keep giving me wonderful fabric collections to work with. You should be able to find this line at your local quilt shop. I know several shop owners have called me to order patterns for kits, so check your local shops and pick up some of this yummy yardage. Fabric Kits for Fair Isles Winter are now available from ConnectTheBlocks.com. You will love these first quality batiks and white-on-white prints! Each kit includes the fabric for one featured block and one sashing block! The $29 per month fee includes postage and the finishing kit for all the borders. The kits will be offered one per month for 14 months starting in February 2017. Peggy put together one great value for this 88" x 88" queen-size quilt. Click HERE to order your first kit for Block 1. And while you are shopping at ConnectTheBlocks.com check out her other amazing fabrics and kits, and her 40" yard cuts! Her fabric is wonderful, her packaging is so cute, and her customer service is amazing! It is not too late to sign up for the Morning Glory Designs monthly newsletter and get the additional free Bonus Block in your email. *Your name and email are secure and will not be shared with anyone! It is used solely for the purpose of sending my monthly newsletter. Here is Bonus Block 1. I know, it looks really scary, but you can leave out the scary parts, if you prefer, and then you have a very non-scary sweet block. Block 2 will be posted this weekend so don't miss your chance to get the first block and first bonus block for free!